Honda says it has no plans to offer a production version of its newly unveiled Personal Neo Urban Transport concept (or P-NUT for fans of painful puns). This is just as well, for if it were to put a version on sale, no doubt it would swiftly hear from lawyers representing Gordon Murray. The P-NUT explores many of the same avenues visited by Murray’s much-anticipated T25 city car, in the attempt to pack the maximum people into the minimum vehicle. So exactly what do the two cars have in common? Fold-away seats for versatility? Check. Narrow nose and swooping screen pillars? Check. Of course we don’t actually know exactly what production T25s will be like, assuming any are ever made, so there may also be marked differences between the two beasts. For example, it has been reported that the T25 will have a single, front-entry hatch for passenger access, whereas the P-NUT has two conventional doors. 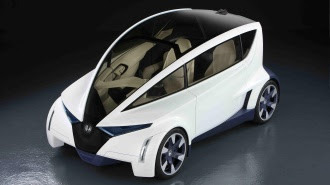 Honda’s concept car is also a metre longer and half a metre wider than Murray’s midget, at 3.4m long and 1.75m wide. For fans of Murray’s work, it’s a comfort to know that if the man himself can’t get his ideas onto the road, at least others think he’s onto something.